My presumption in first approaching a review of Randall Sandke's new book was that his “racialization of jazz” (7) was setting up a target that would be easy to shoot down—a “straw man” of sorts—for example, an approach adopted by several writers that excludes all contributions of white musicians to jazz. From glancing at other reviews of this book, I was left with the impression that Sandke had an agenda he wished to further; that this was an observer who felt that white musicians had not been sufficiently acknowledged and wanted to correct the record accordingly. Sandke’s work makes it clear, however, that our understanding of the role of race in jazz as well as the roles that jazz plays in American culture has been distorted by the ideological agendas of many other writers, some well-meaning and others much less so. His exhaustively documented book is a revelation, not unlike that I experienced when first reading Howard Zinn's eye-opening and de-mythologizing approach to American history, A People's History of the United States (Harper & Row, 1980). A major goal of Sandke’s book is to report what has routinely been left out of jazz histories, especially those which overemphasize 20th century African American culture. Is jazz primarily an African American contribution? Yes. Is it entirely African American? No. Sandke identifies numerous forms of interaction between African American sources, white sources, and U.S. commerce. I especially appreciated the call for further research into many of the concerns about the “mythology of jazz” that Sandke addresses. As in science, new discoveries generate many new questions. In this regard, Sandke notes that one of the least studied aspects of jazz is its audience, which - contrary to what many may believe - has been racially diverse since the beginnings of jazz. In his chapter, “The Biggest Myth of All,” he persuasively documents the interracial audience for the music. He also asks why particularly influential segments of the jazz world (notably Wynton Marsalis and Stanley Crouch) have turned their back on new approaches in order to recapitulate the past (124-125). These questions, in turn, lead us to ask what might be said about innovative European musicians of the swing era such as Django Reinhardt, Latin American jazz musicians, such as Paquito D’Rivera, and current stars with roots in Southeast Asia, such as Vijay Iyer, Rez Abassi, and Rudresh Mahanthappa. They also lead us to ask about the role of such European (predominantly white) recording companies as ECM. As a student during the 1960s, I read Amiri Baraka's (LeRoi Jones’) Blues People (William Morrow, 1963) and A.B. Spellman's Four Lives in the Bebop Business (Pantheon, 1966) at the same time as I was hearing the leading jazz bands at such New York City nightclubs as the Village Vanguard and Slug's. I was listening to the avant-garde recordings of John Coltrane, Archie Shepp, Ornette Coleman, and Cecil Taylor and attending revolutionary rallies in New York promoting social justice and civil rights and attacking the war in Vietnam. I naively conflated the music with the rhetoric, the publicized racial issues with the music's stylistic advances. It was only as a consequence of my own maturity and later reading of revisionist research such as Mark Gridley's “Misconceptions in Linking Free Jazz with the Civil Rights Movement” (College Music Symposium, Vol. 47, 2007, 139-155), John Gennari's Blowin' Hot and Cool: Jazz and Its Critics (University of Chicago Press, 2006), and now Sandke's book, that I have been able to tease apart the musical advances from the concurrent race politics and sociology. Sandke's documentation of the political leanings of jazz journalists and historians identifies age-old threads in the reverse racism (“Crow Jim”) that is currently popular among a few writers and teachers: “...several generations of jazz writers believed it was their duty to combat racism by depicting the music as an outgrowth of African culture; as the product of an insular black community; and as a reaction to segregation and discrimination” (39). In contrast to this prevailing view, Sandke cites the Louisiana historian Jerah Johnson who argues that “Jazz had its origins not in segregation, but in the assimilative tradition of easy interaction of peoples that prevailed in New Orleans” (54). Among the numerous highlights of Sandke's book is a section titled “African Genesis” (39-44). This is one of the many discussions that could easily become the subject of an entire book examining the ethnomusicology of African retentions evident in jazz. Earlier attempts, such as Kaufman and Guckin's African Roots of Jazz (Alfred, 1979), though well meaning, have fallen short. For instance, Sandke argues that most such writers missed Paul Oliver’s observation, in his book Savannah Syncopaters: African Retentions in the Blues (Stein and Day, 1970), that “Improvisation on a theme, which is fundamental to jazz, also appears to owe little to improvisation with tight rhythmic patterns on the [African] drums…Whatever the links with African drumming, conceptually jazz music is very different” (41). Long ago, Amiri Baraka was widely criticized for promoting the view that there was a single collective experience of black people, that such a homogeneous experience was responsible for jazz, and that, as Sandke writes, “...for whites jazz was a 'learned art,' while for blacks it was an indigenous cultural expression” (29). Baraka is not alone in this stance; for example, jazz critic Albert Murray has said (in an interview with jazz musician/music historian Allen Lowe) that “White musicians can never play as well as black musicians; sure, they can learn to play jazz, but it is like learning a second language. You can never be as good at it as you would be if it were your first.” At the same time, the eminent African American trumpeter-composer-novelist-essayist Ralph Ellison has written, “The tremendous burden of sociology which Jones [Baraka] would place upon this body of music is enough to give even the blues the blues” (cited by Sandke, 29). Ellison argued that Baraka ignored the cross-pollination between black and white influences. Nonetheless, while Baraka has his critics, his activist writings have informed a mythology popularized by the media which still permeates journalism and music education about the roots of jazz and the proposition that it is not possible to separate jazz from a “monolithic black culture” (34). Sandke effectively challenges this mythology. Of particular interest to those readers who are musically trained will be Sandke's exploration of the rhythmic and harmonic dimensions of bop. Terms such as “harmonic rhythm” may be unfamiliar to nonmusicians, but the salient points (“harmony was a motivating factor”) (62) are made in a cogent and readily comprehensible manner. Likewise, in the chapter, “What Gets Left Out,” Sandke addresses the usually neglected link between jazz and the European classical tradition. It may come as a surprise to some to learn how intimately familiar jazz musicians often are with Bach, Mozart, Stravinsky, and other major composers. Again we are reminded that it is misleading to overemphasize the insularity of black culture. Also likely to spark controversy is the contention that whites have long “maintained” and “nurtured” black culture. (161) Yet Sandke presents evidence to support this view, as well as testimony from such well-known African American musicians as Terence Blanchard and Christian McBride that blacks may be underrepresented in the core audience for jazz. African American jazz trumpeter Nicholas Payton is quoted: “Jazz, sad to say, probably has no social significance to most black people’s lives.” (161) Though he allows that the appeal of jazz (however jazz is defined) is broad enough to cross all boundaries, Sandke seems to suggest that for the black psyche the importance of jazz may be more a matter of “racial pride” (163) than actually attending jazz performances. Drawing upon business statistics and numerous interviews, many of which were freshly obtained by Sandke, the book provides a well-documented account of how jazz has existed within the music industry in America as a whole. This portion puts in perspective how jazz itself and the way it sounds, more than race in particular, led to the ways that this music has been treated in the U.S. market place. The author demonstrates that unkind attitudes and neglect have pervaded the reception of jazz, and only some of those responses can be attributed to racism. Sandke explores the business of jazz in Chapter Eight, detailing the domains of the recording industry, "an equal opportunity exploiter" (168), the studios, agents and managers, and even the “preponderance of Jewish business figures” in the jazz business (196-197). In the following chapter, Sandke breaks down the thorny problem of copyrights and again concludes that exploitative behavior is often colorblind. His report on such practices is filled with fascinating revelations regarding the problem of who deserves composer credits in jazz. Though many jazz fans are familiar with some of the examples mentioned, Sandke offers so many others that even the most knowledgeable fans will find something fresh in these accounts. And in Chapter Ten, the third on the music business, once again Sandke digs up the facts and figures to dispel the myths, for example, the conventional wisdom that white jazz musicians have consistently out-earned their African American counterparts. After considering the problematic notion of "race" and its complex and checkered history in the United States, Sandke’s final chapter, “Tomorrow Is the Question,” looks at the current state of race relations in America. Sandke again criticizes Amiri Baraka for “stirring up old racial animosities” (241) and deplores the “depressing trend … [of] … the increased influence of critics” (243), taking the latter to task for their failure to recognize individual creativity and thus help to promote “new and authentic jazz stars today.” (243) We realize it is ironic that one faction of the African American community “still holds jazz at arm's length,” (244) and champions school textbooks that “reflect a bias against showing blacks as musicians” (245) whereas another faction claims cultural ownership of jazz and wishes to tout it as the great achievement that it is. Sandke is clearly not burdened by any obligation to appear politically correct! 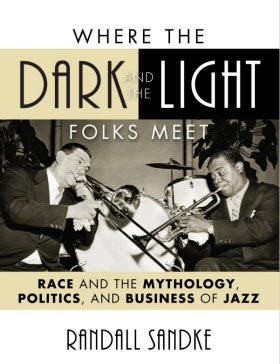 His optimistic premise that a greater understanding of jazz will result “in greater empathy between the races” (246-247) is worthy of research, and Sandke's thought-provoking book is a wake-up call for such attention by scholars. Rob has been a valued JazzErie member and supporter since its initiation in 1994. For decades he has served as a jazz DJ on WQLN radio. He currently hosts JazzFlight every Monday through Thursday, 9 pm to 11 pm. You can listen to the program here, and review Rob's playlists here. For help on listening through the Internet, see the JazzErie On the Air Now page. Rob serves as Professor of Psychology and Chair of the Psychology Department at Mercyhurst College. He and musician, psychologist, professor and author Mark Gridley, who formerly taught at Mercyhurst, published an article in the September 2011 issue of Psychology Journal, "Demand Characteristics and Religiosity in Perception of Emotion in Music." It is the latest in a series of studies the authors have conducted on the influences of how we perceive emotion in music. NOTE: This article has been accepted and will appear in a forthcoming issue of the journal Popular Music and Society.